I wonder how many people have read or sung the Mother Goose rhymes to their children. Many thousands I am sure. The interesting thing is that though the world has changed so much since they were written, there is something timeless about the wonderful little rhymes. Today's poetry title is a board book which contains sixteen nursery rhymes that have been lovingly illustrated by Rosemary Wells. The sun is up and it is time to wake up and get going for there are “Peas in the pot and a hoe-cake baking,” and soon we will start our day. We need to brush our hair and warm our hands by the fire. Some of the men “are gone to plow” while others have gone to sea in a boat and maybe, in the evening, children will have “a fish / In a little dishy / When the boat comes in.” For those who stay at home there are dishes to wash and wipe, and tea that has to be made. In this wonderful board book, Iona Opie has brought together sixteen nursery rhymes that carry us through a day from sun up to sunset. Some of them gentle and soothing, others are funny and sweet. The lines of verse celebrate the beauty of the written word, and introduce babies and little children to some of the gems in the English language that were written just for them. I love libraries! When I was a child I would go to the local British Council library to spend an hour or so browsing the shelves. I would leave weighted down with a huge stack of books. I read about everything and anything. Except subjects that required me to do any kind of maths! Today's picture book celebrates libraries and the joy of reading, and it is a delight. Many children have imaginary friends, and sometimes we encounter such children in stories or films. We smile as they communicate with their invisible companions, who are often blamed when something untoward happens. In today's picture book story the focus, for a change, is on the imaginary friend instead of the child. On the pages meet an imaginary friend who needs one thing to make his life complete. The journey is a long one and it is full of “many scary things,” but the hope of finding his friend gives Beekle courage and finally he comes to the real world, which is a very strange place. 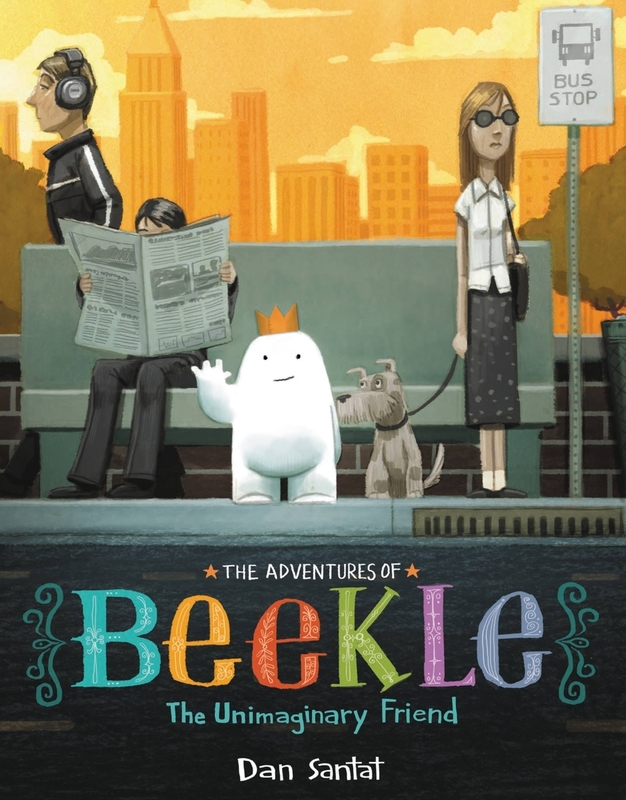 Then, while he is standing on a sidewalk in a big city, surrounded by the legs of big people, Beekle sees an imaginary friend go by whom he follows. Soon he is a playground full of children and their imaginary friends, a wonderful place where surely he will find his friend. Or maybe not. For many parents the Mother Goose nursery rhymes are the first poems that they explore with their children. Over time Little Miss Muffet, the cow that jumped over the moon, and Wee Willie Winkie all become members of the family. In today's poetry title these characters and others from the Mother Goose rhymes come together to attend a special event hosted by none other than Mother Goose herself! One night Mother Goose flies out into the night sky on the back of her goose companion. In sparkles she leaves a message in the starlit sky inviting her friends to come to her house at half past eight for a story time. Mother Goose’s invitation is passed on from character to character, from Jack-a-Dandy to Wee Willie Winkie, and from Georgie Porgie to Little Bo-Peep. Finally Nimble Jack, with his candlestick, leads the way to Mother Goose’s house with all the other nursery rhyme characters following him. Along the way they collect the crooked man and the cooked mouse and they walk along “the final crooked mile,” until they come to Mother Goose’s door promptly at eight o’clock. What follows is a wonderful evening that is full of treats that the guests and the hostess alike enjoy. Written in wonderful rhyming verse, this picture book brings together some of the most well-known nursery rhyme characters, who take little children on a memorable bookish adventure that is full of joy, warmth, and finally comfort. At the back of the book children will find the fifteen nursery rhymes that feature the characters that they met in the book. Many people think that 'art' has to fit into one of three categories. It has to be a piece of music, a painting or a drawing, or a sculpture. However, there are other forms of art that might not fit into one of these pigeon holes. What about a piece of furniture or a quilt? What about a basket or a glass vase? What about a wrought iron gate or a musical instrument? What about a tree or shrub that has been clipped and clipped until it looks like an animal or some lovely shape? All of these things are also works of art, and all of them can, and do, enrich out lives. In this picture book we see how a topiary artist manages, one topiary at a time, to bring beauty to the lives of people who so desperately need something in their world that will uplift them. Grimloch Lane is a rather sad place. The homes are ramshackle, weeds grow up through cracks in the sidewalk, and the people who live there don’t really connect with one another. One night, while everyone in the lane is asleep, a man gets to work on one of the trees that stands outside the Grimloch Orphanage. The following morning another tree on Grimoloch Lane has been turned into a work of art. This time the topiary makes the tree look like a cat at rest. Each day a new topiary appears, and now the people living in Grimloch Lane have something to look forward to. They gather to admire their beautiful topiaries and “Something good” starts to happen to everyone who sees the special trees. We tend to think that real change can only happen when something really big happens, but sometimes change can come about when a little piece of magic is added to our lives. As the story in this book unfolds, we see how the introduction of beauty affects the people who live in a place that has so little beauty and happiness to offer. Best of all, the instrument of change is not someone who is rich and powerful, instead he is a humble person who just happens to have a gift for turning already lovely trees into gorgeous works of art. Cats are singular creatures. They are not as easy to understand as dogs, but once you develop a relationship with a cat you will soon see how much that relationship enriches your life. Today's poetry book introduces you to some colorful cat characters, and the poems also explore the ways in which those cats enhance the lives of the humans that they share their lives with. Many cats live on Grandmother’s farm and she knows each and every one of them. Grandmother does not care if her cats are beautiful or “scrawny.” She does not care if they have too many toes, or if they are tailless. All the cats are welcome in her home and all of them are loved. One day a little, grey tabby cat arrived on the farm and she “graciously offered to stay.” The cat is loved by everyone and is soon very much at home. It is decided that the cat will be called Cougar, even though she is about as un-cougar-like as a cat can get. She is loving and sweet, playful and gentle. There are times though, when she is fast asleep, when perhaps, for a moment, she seems to live up to her name. Grandmother lives with her sister and the two old ladies are as “different as sugar and salt.” One likes to grow flowers, while the other likes to plant vegetables. One loves to write poetry, while the other prefers to make pies or to cut back weeds. Though they are as “different as ribbon and string,” both ladies have a soft spot for cats. One stormy night the two of them together gather up three “half-wild” kittens and bring them into the warmth and shelter of their home. This wonderful book serves as a tribute both to cats, and to the people who take them in and care for them. We meet a variety of cat personalities on the pages, and we also come to appreciate how special Grandmother is and how much of a haven she has created on her farm for felines, and for children who love felines. Throughout this book the author’s poems are paired with beautiful paintings that perfectly capture the cats described in the text. I used to be more of a dog person than a cat person, but then I adopted Katie, a tiny black and white kitten, who had been literally thrown away. Katie, who never weighed more than five pounds, taught me to appreciate the true nature of cats. Despite her rough start in life, she was loyal, strong-willed, sensitive, and loving, and I am grateful that she was part of my life for more than a decade. Though she was very small and not very strong, Katie never let anything get her down. She was an inspiration. Today's poetry title explore one woman's relationship with her cat Boris, and through her narrative we get see how Boris shaped her life and how he helped her understand herself better. I think it is fair to say that these days many people have lives that are perhaps a little too full. They feel as if they are running on a treadmill, desperately trying to keep up, and to do all the things that are written on their to do lists. Adults are not the only ones who have this problem. Sometimes children find themselves struggling with a schedule that asks just too much of them. Andrew loves to perform in plays, and so he decides to join the school drama club so that he can “wear costumes and perform on a real stage.” Andrew’s best friend, Edie, helps him learn his lines as they walk home from school together. Sometimes they end up climbing a tree or playing a game along the way and that’s always fun. Though Andrew is a natural when it comes to acting, his drama teacher suggests that he try public speaking so that he can learn how to project his voice more. Andrew joins the debating team so that he can work on making his voice stronger. It turns out that Andrew is so good at debating that his friend Calvin suggests that he join the chess club. When Andrew has a hard time keeping up during the dance routines when he is rehearsing, he decides that what he needs to do is to “improve his coordination,” so he attends ballet and karate classes. Somehow Andrew then finds himself joining the tennis team, working on the school paper, and learning how to play the bagpipes. He joins the French film club, takes singing lessons, and signs up for Spanish lessons because knowing another language is “just plain useful.” Up until now Andrew has been able to manage his extremely full schedule, but now he hits a wall. Andrew is just doing too many things. Many people over-schedule their lives. They fill every spare minute with an activity of some kind until they barely have time to eat or sleep. They cannot have a social life and are constantly running from activity to activity. With humor and sensitivity Ashley Spires (who brought us the graphic novels about Binky the cat) shows us how a young owl’s life turns into a nightmare when he takes on too many activities. Everything Andrew does is important and interesting, but together they are just too much. Children, and their grownups, will enjoy seeing how Andrew solves his problem and how he finds a schedule that works for him. When I was growing up on the island of Cyprus in the Mediterranean, I read many of the Greek myths. Some of the places mentioned in the myths I was even lucky enough to see in Greece, including Mount Olympus, where the Gods were said to live. In today's book readers will encounter some of these myths but in poetry form. And the poems they will encounter can be read in two ways, which makes this bookish poetry experience quite unique. Happy Poetry Month! Often we like to think that there is only one side to a story, the side that we believe in. The truth of the matter is that usually there are at least two sides to a story that often contradict each other, two perspectives as seen through the eyes of two very different people who are on opposite sides of the story. In this very unique book of poetry the author takes us into the world of Greek mythology so that we can explore the two sides of some of Greece’s most famous stories. The myths were created so that people could explain the world they lived in, a world that was often full of chaos and unknowns, which is perhaps why so many people are drawn to them. This is the first myth that is explored in this book. We are presented with two poems, placed side by side, and hear the story from two points of view. In one Pandora is blamed for what happened, and in the other we are see that Pandora could well have been Zeus’ pawn, that he planned the whole terrible businesses. What makes things interesting is that the second poem is the reverse of the first, with the last line of the first poem serving as the first line of the second. In the poem King Midas and his Daughter, the story of the king whose greed led to his daughter being turned into a gold statue is told first from the point of view of the daughter and then from the point of view of the king. The daughter’s voice tells us how she was “so needy / so greedy” for a loving touch from her unaffectionate father. The father’s narrative tells us that he was “ so greedy / so needy” to have the magic touch that turned things into gold, and he paid dearly for the gift he was given. The other myths explored in the book include the story of Arachne and Athens, the tragic tale of Narcissus and Echo, and the ill-fated story of Icarus and Daedalus. The poems in this book show great creativity, and they certainly bring old myths to life, but they do more than that. This book shows, to great effect, how problems might arise when two people see the same thing from only one point of view.